In Where's Waldo? 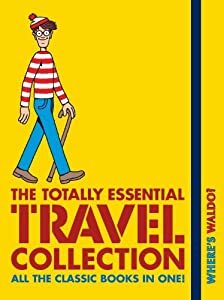 The Totally Essential Travel Collection Waldo seekers on their own voyages will be raring to go with this compact compilation featuring all seven of his renowned excursions: Where's Waldo?, Where's Waldo Now?, Where's Waldo? The Fantastic Journey, Where's Waldo? The Wonder Book, Where's Waldo? In Hollywood, Where's Waldo? The Great Picture Hunt, and Where's Waldo? The Incredible Paper Chase. Martin Handford has created the ultimate collection of WHERE'S WALDO? in this compact travel addition. Each set of pages not only has the classical WHERE'S WALDO? but he has included other characters and things to locate. He even included a list of the items to find on each page so you could check them off as they are discovered. Martin included such minute details in his drawings from ski slopes to Egypt, the crusades to the beach , and much more. You will definitely find challenges in locating not only Waldo but the other objects and people. This collection will provide hours of entertainment. If you enjoy WHERE'S WALDO?, you will certainly want to purchase this new edition.